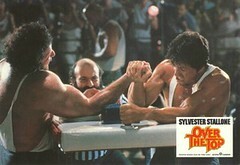 If the Yahoo/Microsoft saga followed the storyline of the classic movie “Over the Top,” this latest move by Microsoft would be most analogous to the moment when Stallone switches his grip, puts on his “Rambo” face, lets out a boorish groan and turns the tide on the poor sap on the other side of the arm wrestling table. At this moment in “Over the Top,” the audience remembers that Lincoln Hawk isn’t just a down-on-his-luck big rig driver, he’s Sylvester freakin’ Stallone! We’re talking about the man that took on Mr. T and Hulk Hogan in a single movie, the guy who single-handedly blew up half of the US military. At this moment, we all know that Stallone isn’t going to lose and that the new big rig and, for some weird reason, custody of his estranged son, would be his very shortly. Just when you counted him out, he flips the script and reminds you why it was foolish to ever doubt him. In this scenario, Steve Ballmer and Carl Icahn represent Stallone. In this scenario, it looks like Jerry Yang and Yahoo’s Board of Directors represent the guy who entered an arm wrestling match that they never stood a chance of winning. Yang has insisted time and time again that the Yahoo/Microsoft deal was dead. Each time he did so, flurries of articles followed confirming this notion. Sure, Yang and Co. still had a lot of work to do, but it seemed that they would be moving on with Microsoft left in their wake. When a deal with Google looked imminent, it seemed that Yang and Co. had Ballmer and Icahn’s wrist just centimeters from the mat. At this point, though, we had made the mistake of forgetting why Ballmer and Icahn are Ballmer and Icahn. Here’s where they switched the grip and changed the game on Yahoo. Today, Icahn released a letter in which he indicated that the deal was far from dead. In essence, he wrote, “…if a new board were elected, [Ballmer] would be interested in discussing a major transaction with Yahoo.” Microsoft followed with an announcement declaring that Icahn’s statements were genuine; that Microsoft supports the shareholders right to form their own opinions as to the direction of Yahoo as a company. The indication, though, is made very clear that the new direction (i.e. a Microsoft takeover) would include neither Yang nor the current members of Yahoo’s Board of Directors. Yahoo’s response–and the fact that stock prices seem to jump up only when talks of a merger renew–cannot be comforting to Yang and the Board. It seems that a possible merger of Yahoo and Microsoft is still very real and, when you really think about it, would you really want to bet against Ballmer and Icahn if the two of them share a desire to unite the two Internet giants? Lincoln Hawk’s hat is spun around backward. He’s arm wrestling for the championship and he’s just switched his grip. The look in Hawk’s eye is familiar from so many other Stallone movies. Tell me, knowing all this, would you bet against him? This movie is in serious contention to be the absolute greatest movie ever made! The intricate yet subtle plot lines, character development, and acting are all world class. Stallone is a giant among ants.